In case you missed it, Bill Belichick put Adam Thielen in his place on Sunday. 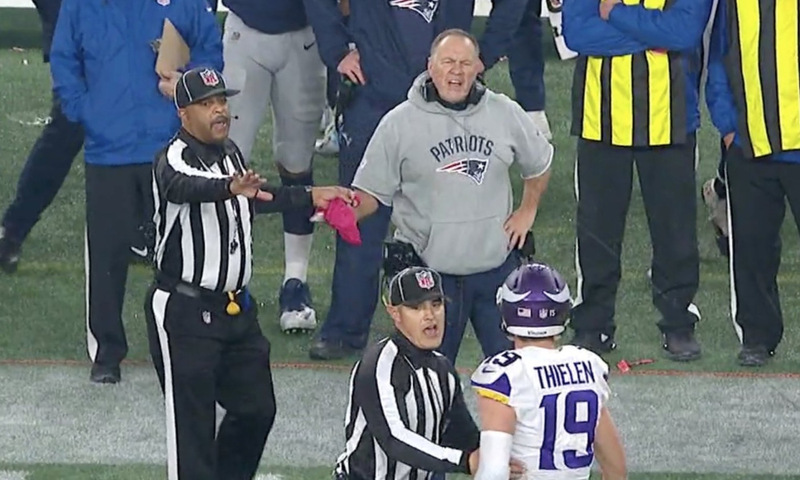 With the Pats leading 24-10 in the fourth quarter, Thielen decided to confront him and question the legitimacy of Patrick Chung’s brief injury that gave Bill time to throw his red flag in disgust. The reason he was throwing the flag was because his defense stuffed the Vikes on fourth and inches but were given a horrible spot. From arguing with refs and trash-talking opposing players to showing zero emotion when his own team scores, Belichick displays far more character when he’s angry than when he’s happy. We knew that, but this video confirms it. Hopefully the Pats can continue to cruise and keep him quiet for the rest of the season, although I don’t mind seeing him lose his mind once in a while. Really gets the blood pumping.